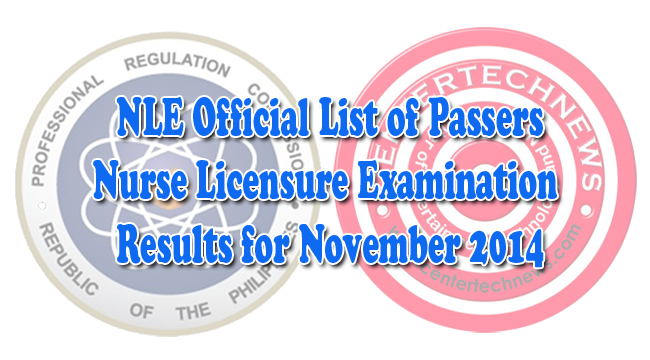 The list of Top 10 passers of those who had taken the November 2014 NLE if finally released by Professional Regulation Commission (PRC) on January 23,105. The result had been released less than 40 working days and the top notcher came from Pamantasan ng Lungsod ng Maynila. Elijah Catacutan Legaspi got the highest passing rate of 86.80 percent followed by a percentage of 86.60 got by three passers namely Geastyne Lauren Galang Nolido of Wesleyan University- Philippines- Cabanatuan City, Janelle Joy Fernandez Ponferrada of St. Scholastica’s College -Tacloban and Ralf Jay Villanueva Retotal from mariano Marcos StateUniversity- Batac. The test takers took NLE in two consecutive days. Takers must have at leact a passing rate of 75 percent with no subject with a rate lower than 60 percent. The test consisted of five parts which are Basic Foundation of Nursing and Professional Nursing Practice, Community Health Nursing and Care of the Mother and Child, Care of Clients with Physiologic and Psychological Alternations - Part A, Care of Clients with Physiologic and Psychological Alternations - Part B, and Care of Clients with Physiologic and Psychological Alternations - Part C.
Those who passed must follow the scheduled date of their registration in their respective PRC offices. The registration will start on February 9, 2015. Those who failed to register for their PRC ID and Certificate of registration can only register after the scheduled date for all passers is done. To register, passers must bring their accomplished Oath Form, Cedula, 1 passport sized photo with full name tag and white background, 2 sets of documentary stamps, a short brown envelop with complete name and profession and an initial registration fee of 600 pesos with Annual Registration fee of 450 pesos.